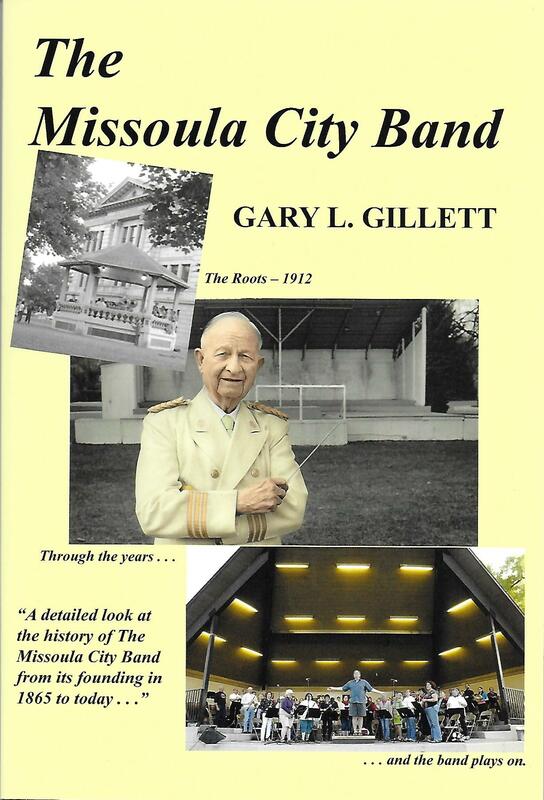 The history of the Missoula City Band, in many ways, is a mirror image of the history of Missoula, Montana. Since Montana's birth--since the time Montana was only a territory and not yet a state--the Missoula City Band played. Through two world wars, the Great Depression, through a surge of pioneers moving west, and into contemporary times, its horns blew, reeds vibrated, drummers drummed and cymbals crashed. And our community has enjoyed many performances! Learn about the band's maestros, its musicians, its triumphant as well as trying moments. Written by Gary L. Gillett, who recently retired after forty-one years of teaching music. He grew up in the Detroit suburbs, went to the University of Michigan and studied with the greats - including Dr. William Revelli! A command performance at Carnegie Hall capped the "eastern years". He moved "out west" to Nevada briefly, and then home to Montana. A Master's of Music Education from the University of Montana and a Fellowship to Northwestern University to study with Dr. John Paynter continued professional development. Conducting the Missoula City Band in weekly concerts at the Bonner Park Bandshell since 1993 has been the thrill of a lifetime for Gary.